﻿ Help! My Numerical Reasoning Test is in 3 Days! Home Tips & Tricks Help! My Numerical Reasoning Test is in 3 Days! 17 Oct 2011 Print Help! My Numerical Reasoning Test is in 3 Days! Sleep is vital to proper brain function – so get a solid 8 hours the night before your test. Eat a good breakfast (or lunch) and avoid excess caffeine. Also avoid heavy carbohydrates, which can make you feel sluggish and tired. Dispel initial-test nerves by taking online practice tests, specifically numerical reasoning tests as well as number, and word puzzles. Get familiar with the various types of aptitude tests, no matter what type of test you are taking you can delve in without feeling like you are in uncertain territory. If possible, find out what test publisher is being used so you can try online tests specific to that publisher, which should help make the test feel more familiar. Find out when your actual test is scheduled, then take practice tests at the same time of day. Avoid drinking more than one cup of coffee or water during the test, as bathroom breaks are normally not permitted. There’s nothing more distracting than the need to go to the bathroom while you are trying to concentrate on the task at hand. Have a small snack just prior to the test (fruit, nuts, granola bar, etc.) to raise your blood sugar levels and give you enough energy to keep you motivated for the duration of the numerical reasoning test. Should you need any, ensure you have any disability aids ready – hearing aids, etc. The administrator should be notified that you may require additional assistance before the test begins. If you need to take an alternate test format due to a disability the employer / assessment centre should be notified well ahead of time. If you are taking multiple tests in a single day and have time, go for a brisk walk between sittings you get your blood flowing and help renew your energy levels. Make sure you know exactly where you are going and can give yourself enough time to arrive 30-60 minutes before you need to check in, to give time for unforeseen circumstances. While it can be easy to let your nerves get the best of you during an important test, remember that it is just a test! Even if your first round of testing does not lead to an immediate position you have given yourself some valuable practice that will certainly come in handy. Get started today with psychometric online tests so you can ensure you are ready. Need FREE advice? 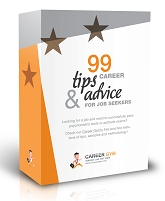 Check our 99 Career Tips E-book or contact the Career Coach for expert insights!